Story by Devon Williams. Photo by Christen Gans. NOV. 21, 2017: November 9, 2017, was the date of the honor roll ceremony for Tech Prep Middle. Many of our school’s scholars were celebrated. This was the first quarter ceremony. One student received Principal's, Honor Roll. As a school, we hope that all of our scholars can be able to receive Principal’s Honor Roll which is given to those scholars who maintained a 4.0 or higher. That is one of the many ways that Tech Prep honors those students who have been working hard, making sure they have good grades and doing what is needed throughout their school day. The event also encourages more students to want to achieve high academic scores. 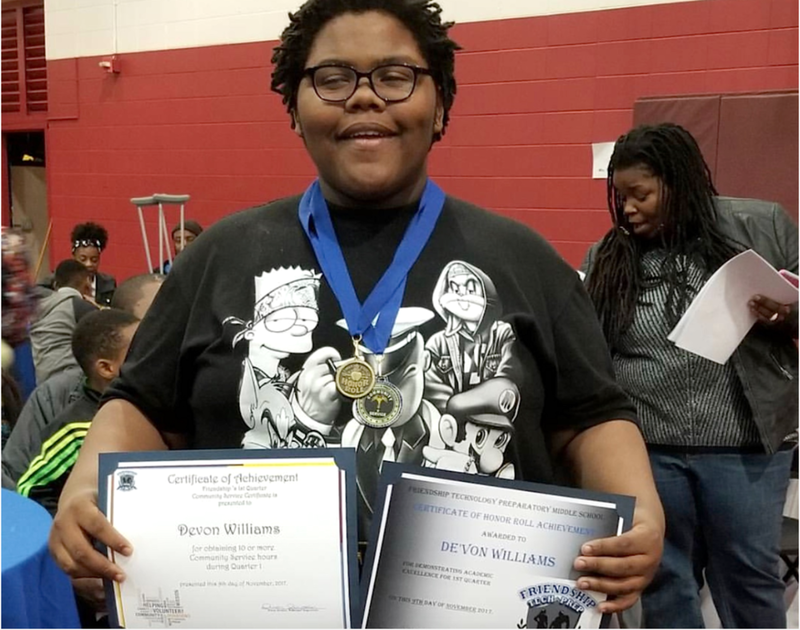 Devon Williams and Christen Gans are 8th grade scholars at Friendship Tech Prep Academy.